If you want an easy project to spice up your next party, chances are you already have parts on hand to throw together [Mikerbot’s] quick and dirty VU-meter lights. The circuit he designed uses the audio input to trigger the base of a PNP transistor, toggling power through a string of LEDs. He’s using four lights for each of the stereo output signals, making them pulse with the music as seen in the video after the break. 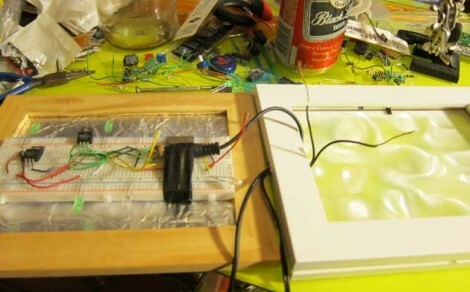 The circuit is built on a breadboard, and housed in a picture frame with a less-than-impressive diffuser (we think that’s always the hardest part… check out the Heavy Frost used in this project if you want something that works really well). There are some VU meter chips out there that will really augment this concept. But one improvement might be to throw in an amplifier chip like the LM386 and a couple of potentiometers so that you can dial-in the sensitivity. needs more seperation. make 8 channels but only use 4 to give a better seperation between them for a nicer look. I don’t quite get why a breadboard was chosen for this. I love breadboards and can never have enough of them at home, but for permanent projects, they just won’t cut it. That said, I was wondering about the audio connection. I see the audio ground is directly connected to ground–is this safe for the equipment involved or should you try to use a transformer? The audio ground is technically not supposed to go to circuit ground all the time, but is often used in that way to simplify things. It really makes a negligible difference if the ground is attached like that on the destination end of the audio cable versus the signal end. The signal end can introduce all sorts of noise into the audio. then again i didnt read through the whole thing, and ive seen how good this circuit works WITH the resistors… so awesome project in that respect, and your idea for puting it in a pictureframe is high on the W.A.F. / Gf.A.F. and looks sweet! Diffuser is not a problem. Rosco and Lee have a number of different ones with different levels of diffusion. Just put a sheet of what you want under the glass of the picture frame. I think the schematic has the polarity of the 12V input reversed. Perfect for a party where we’ll be drinking Black Label!